The easiest ways to stock up on Olive Wood in Assassin's Creed: Odyssey. In Assassin’s Creed: Odyssey, one material gamers have been struggling to get is Olive Wood. When it comes to building things in the game, Olive Wood is essential. Additionally, Olive Wood is used to upgrade armor and weapons. With so many uses for Olive Wood, it can be easy to run out. To help, we’ve put together a quick guide on how to get Olive Wood in Assassin’s Creed: Odyssey! 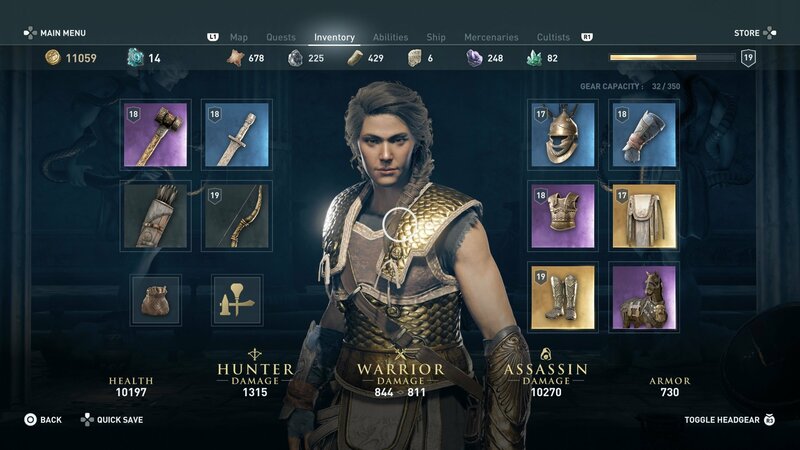 In your menu near the top, you can view how much resources you have including your available supply of Olive Wood in Assassin's Creed: Odyssey. One resource you’ll need to know how to get in Assassin’s Creed: Odyssey is Olive Wood. With so many uses, you should try and keep a stockpile of Olive Wood on you at all times. To get Olive Wood, you’ll want to explore and scavenge for resources around the map. On the ground, there are plants you can interact with and pick up, and it’s these plants you’ll want to focus on when gathering Olive Wood in Assassin’s Creed: Odyssey. It’s a good practice to scavenge plants whenever possible as you make your way from one area to another. If you’re not on land, but on sea, you can also find bundles of Olive Wood by sailing around and grabbing the bundles when you spot them. Along with scavenging, you can get Olive Wood by looting as it’s frequently included as a random reward drop for opening up chests, defeating enemies, and plundering sunken ships. Meanwhile, if you have pieces of gear you no longer want or need, you can also get Olive Wood by dismantling certain types of gear. Note that not all gear will give you Olive Wood, so be sure to check what resources will drop before dismantling an item. Finally, some merchants sell Olive Wood if you’re in a pinch. For example, the Merchant near the Sanctuary of Delphi has Olive Wood in their inventory, though we recommend running through the other ways to get Olive Wood in Assassin’s Creed: Odyssey before spending your hard-earned Drachmae. For more on Assassin’s Creed: Odyssey, be sure to check out some of our previous guides including what Misthios means in Assassin’s Creed: Odyssey, how to craft arrows in Assassin’s Creed: Odyssey, and how to pass time by waiting in Assassin’s Creed: Odyssey. By reading through this guide, you should now know how to get Olive Wood in Assassin’s Creed: Odyssey.